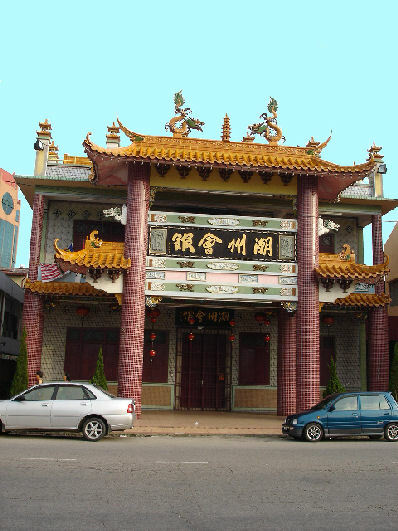 Nan Hai Fei Lai (Goddess of Mercy Temple), also called Ah Nio Keng is located the riverside main road of Jalan Maharani opposite the Bentayan Express Bus Station, is the oldest Chinese temple in Muar. Kerng Tang Kou Bioh Temple - The temple also called Tua Lau Yah Keng is located at the Muar Kwangtung Association building at the beginning point of intersection of Jalan Bakri and Jalan Meriam in town centre was founded by Dato' Chua Tuah Soon and early Teochew people immigrants in 1895. 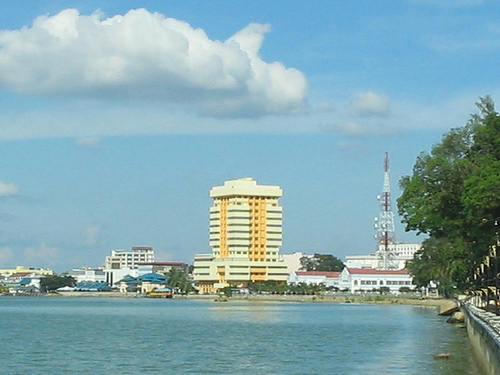 It is one of the oldest temples in Muar town. Its name Kerng Tang Kou Bioh in Teochew dialect means "East Guangdong's Ancient Temple" was derived from Teochew�s geographical location in east of Guangdong/Kwangtung province in China and its ancient Teochew patron deity worshipped at the temple, the "Tua Nang Yah Kong" or "Xu�n Tiān Sh�ngd�" (literally the Lord of Profound Heaven or Black Heavenly Emperor God). It was initially brought in from Riau Islands archipelago, Indonesia by Tan Song Hai for worship in a shop house at Jalan Maharani before it was saved in a fire and relocated and installed at present premises in 1913. The temple was renovated several times and a major one was when the entrance arch with traditional Chinese temple architecture and the big sitting deity statue at the compound build erected in 1998. During the "Chap Goh Mei" celebration on the 15th day of first lunar month of Chinese calendar, the last day of Chinese New Year festival, drove of Teochew devotees will throng to congregate to pray at the temple and to observe a traditional custom, called "Puak Tau Sai". San Chai Temple, Parit Unas - The Parit Unas N�n T�ng S� Temple was founded by late Dato Kor Thian Peng, the temple's medium who was touted to be the foster son of late Johor Sultan for their close relationship ever since the medium helped to cure an illness of a Johor Sultan royal family member and conferred the Johor datukship award. According to legend, the temple divine deity god had protected devotees who seek to hide in the temple during 1969 May 13 racial riots and has in many occasions helps many devotees from near and far especially, droving flocks of local and Singapore to throng the temple to worship especially during the birthday of the divine god, San Chai Yeah on the 23rd day of the 1st moon of Chinese lunar calendar(around January/February after Chinese New Year) every year. A Chinese primary school adjacent to the temple, SRJKC San Chai was built with the Sultan's donation and operates with the aids of the temple. Sian Kong San Temple, Bukit Bakri - A beautiful and tranquil Buddhist temple located on top of a hill at Bukit Bakri with magnificent scenery. Nattukottai Chettiars' Sri Murugan Temple - The oldest Hindu temple in Muar town in Jalan Meriam has a unique and beautiful steeple of the dome with old Indian Hindu achitechture element, but has been torn down as it is now undergoing some major re-construction. It is also fondly known as the Nattukottai Chettiars temple for the contribution of the community in building the temple where local devotees visit for the divine Lord Murugan's blessing since the early days it was built. There is a grand annnual celebration with a chariot procession. Sri Muthu Mariamman Temple Located at 29 Jalan Mohammadiah. Around October end yearly they celebrate the procession of the Amman Chariot. Nagamalai Koil Alaiyam Temple, Bukit Pasir - Snake Hill temple, Bukit Pasir, Muar. Local folks call it Hindu snake temple. This temple, located in the Sime Darby Palm Oil Plantation in Bukit Pasir is said to be a very auspicious temple among Hindus in Malaysia and Singapore. There are small shrines on the forested hill with cobra and Hindu God statues. According to The Star, Nagamalai Alaiyam is the third most important hill temple in Malaysia after Batu Caves in Kuala Lumpur and Thannimalai temple in Penang.